A World War Two type 24V pillbox is visible as a structure on aerial photographs of this area. The brick and concrete structure is built into the sea wall and was part of a larger range of defences around Brancaster Golf Club House. Two pill boxes, 1939 to 1945, built into base of golf club house. E. Rose (NAU), 23 January 1980. Both polygonal, one of brick, the other of concrete now bricked up. Pillbox, type 24V - very rare. Situated on northwest corner of golf course site. Date 1940. The second pillbox noted in 1982 may be a confusion with NHER 33309. 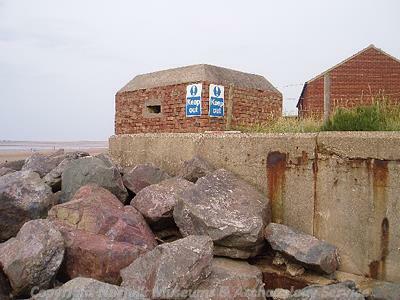 Type 24V pillbox. Part of a wider series of defences surrounding the Golf Club during the 1939-45 period. Visible on (S2). M. Brennand (NMP), 30 April 2003. May-November 2004. Norfolk Rapid Coastal Survey. Context 637. World War Two brick and concrete pillbox. Built into sea wall (or with sea wall built around it) at TF 77041 45174. J. Allen (NLA), 15 April 2005. <S2> Vertical Aerial Photograph: BKS. 1988. BKS 8272 27-MAY-1988 (NCC 0767). <S3> Unpublished Document: Robertson, D., Crawley, P., Barker, A., and Whitmore, S.. 2005. NAU Report No. 1045. Norfolk Rapid Coastal Zone Archaeological Survey. Assessment Report and Updated Project Design..